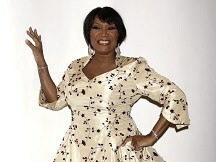 Patti LaBelle will be recognized for her five decades in music at this year's BET Awards. The Lady Marmalade singer will receive the Lifetime Achievement Award, while comedian Steve Harvey will be given the Humanitarian Award for his philanthropic contributions.. This year's top nominee is Chris Brown, who is up for six awards and is set to perform on the live show. Jill Scott and Alicia Keys are also slated to perform. The BET Awards '11 will take place on June 26 at the Shrine Auditorium in Los Angeles.